One of these days I’m going to get a camera that takes decent pictures. Anyway, I finished this tonight. 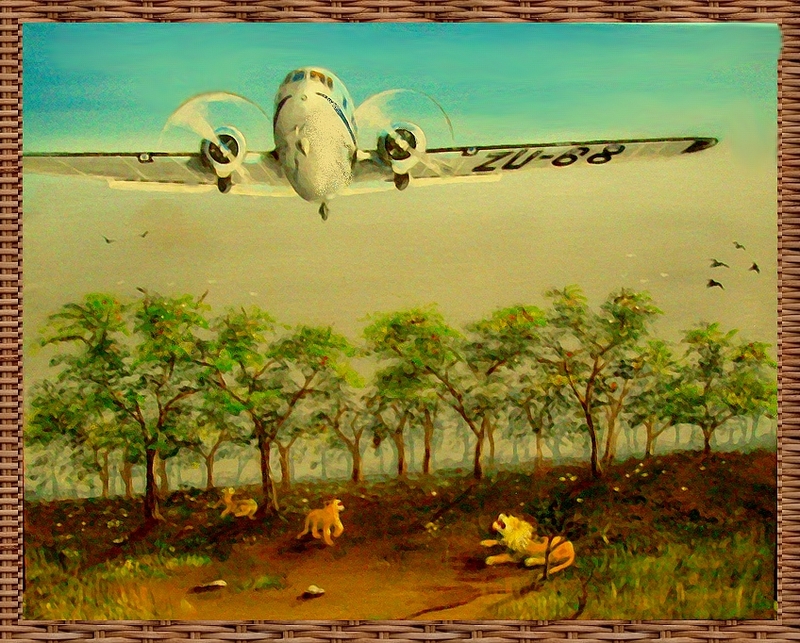 It’s depicting a 1940’s C-47 cargo plane flying over a pride of lions on mildly sloping ground. They are startled and look up at the plane – a sharp contrast between the old world and the new. The light is coming from the right side of the plane. The colors in the painting are 100% nicer than shown in the picture. Can you see the small white birds leaving the trees? They are easily visible on the large canvas. The two round black objects under each engine are the partially exposed wheels when retracted. The lump object under the nose is for navigation and there are two radio antennas forward of it. You can also see the tail wheel. There are 3 lions, can you find them all? This is an early morning scene and that is fog in the background. See how the trees fade into the distance? This entry was posted in Art and tagged africa, C47, Jack Lee Art. Bookmark the permalink. I can almost hear the chest vibrating thunder of the piston driven props. Another winner Jack. I love the lions and birds…there’s life in your work! Only one consideration…I would have preferred a canvas that afforded a bit more sky.